I have a ThinkPad W530 with a Optimus Hybrid GPU, that is an Intel HD4000 and a nvidia K1000M. Yesterday I decided to install the nvidia driver, which seems to be working, however it has messed up my Plasma Desktop. So what I am getting is primarily awful tearing all over, and the Desktop bar is badly misshapen and it gets worse as I resize it, see here https://i.imgur.com/9tQDWsS.jpg . I have tried rebuilding qtcore and mesa as someone else suggested, however it made no difference. I have also added vaulkan driver to mesa but no go. Not sure if that is needed to be enabled somewhere. Sometimes I can temporarily address the tearing and desktop bar issues by playing around with the KDE Compositor options randomly. It takes me about half an hour of tries and it is totally random. It only last one session though. This is my current configuration. - - gles1 : Enable GLESv1 support. - - gles2 : Enable GLESv2 support. + + vdpau : Enable the VDPAU acceleration interface for the Gallium3D Video Layer. - - xvmc : Enable the XvMC acceleration interface for the Gallium3D Video Layer. 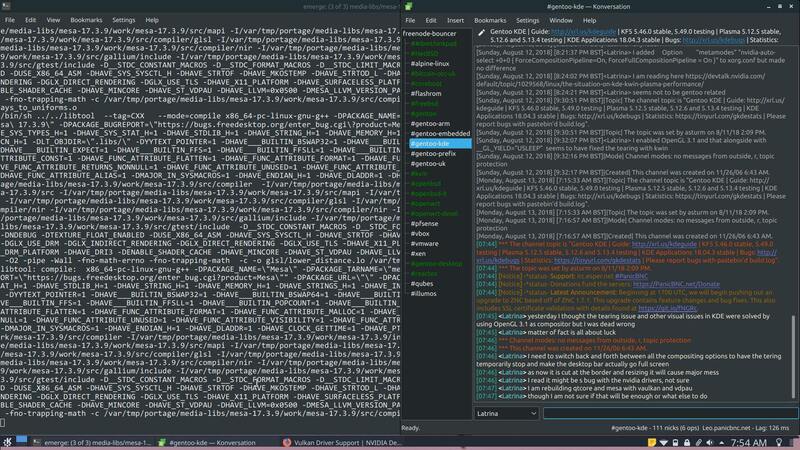 I also added export __GL_YIELD="USLEEP to /etc/profile.d/tearfree_kde.sh but made no real difference. As I said, I tried OpenGL 2.0, 3.1 but no go. Xrandr seems to address the desktop bar issue, however it gives me all kind of different craziness. With the Intel driver it all works fine. Lastly, since you only mentioned KDE and Plasma, have you tested it with other smaller (tiny) window managers to see if the issue persists there? If not then a good place to start would probably be reinstalling kde including whatever meta packages that has. I apologize in advance if the advice doesn't seem to help, but maybe there is some better way to figure out through the log faculties of what is causing the issue, but I am not that much an expert to know myself. I would be curious to see what happens if you switched to a different display manager only. Or else tried running a session-less window manager like i3 or awesome and see what happens there. These are just ideas. This too would appear pertinent, and not so sure if you had seen it. Have you gone through the BIOS to set your discrete graphics mode? Unfortunately I have done all of that. You can only use the Intel alone or you need to use the Optimus option. The discrete graphic alone wont make the system start as the Nvidia does need the Intel GPU to write/ reproduce frames to it. So I'm actually not trying to suggest you have to limit your options, but have you considered just running the integrated graphics portion of the dual gpu that is the intel side of it since you said yourself that everything works with that? What end purpose does it serve to have the nvidia stuff working? Unless you are gaming or something it may make little difference...do you catch my drift there? ?